Small Rama Navami Celebrations on Tuesday! ~ The Toronto Hare Krishna Temple! Small Rama Navami Celebrations on Tuesday! Devotees are welcome to come out for this nice, intimate evening to celebrate the appearance of Lord Ramachandra, the incarnation of Lord Krishna who was the perfect monarch. 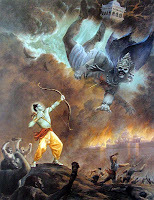 wow!is ram navmi today it is my birth days alo!